It has been almost three decades since Canada was among the leading contributors of troops to United Nations peacekeeping missions. In late 2017, the government announced Canada’s return to peace operations and, in March 2018, Canada deployed an Air Task Force to the UN mission in Mali. With the one-year period allotted for the Canadian mission coming to an end (although, we should note, a stable peace has NOT been achieved in Mali), Canada is preparing to pull out. Only partway through the deployment, some security experts were disappointed to detect a lack of interest by the Canadian government in what was happening in Mali—and in “peacekeeping in general.” Months ago, it was apparent that Canada did not intend to extend its stay in Mali. The news that Canada would not extend its stay was not a surprise to most observers. For decades, analysts have observed repeated Canadian promises to support UN peace efforts—and the subsequent lack of significant follow-through. In 2007, journalist Michael Valpy noted that Canada’s commitment to maintain a Standby High Readiness Brigade for United Nations Operations to provide a rapid deployment of troops for up to six months was a mere “will-o’-the-wisp.” Not much has changed. And so, on January 31, Global Affairs Canada announced that Romania will take Canada’s place in Mali, supplying the same number of troops and transport helicopters. It is not clear whether Romania will be providing the same medical airlift capabilities. Canada, like most developed countries, has stepped back from UN peacekeeping. We’ll provide money, but developing countries can supply troops and police. What should Canada do now? Canada has made “smart pledges” to UN peacekeeping, but has not apparently developed any guiding vision to fulfill them. Perhaps Canadian citizens can help! 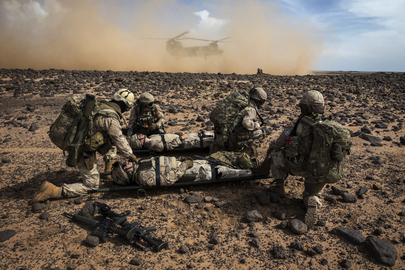 Canadians generally support a greater involvement of the Canadian military in peacekeeping. In a 2016 poll, 70 per cent supported the deployment of Canadian Forces on UN peacekeeping missions. But it is true that peacekeeping has changed and not everyone is eager to send our forces into harm’s way, especially when there is no obvious Canadian interest to serve. In the leadup to the Mali mission, some commentators said that Mali was too dangerous, with little peace to keep. Most noted that peacekeeping is simply more violent these days; contemporary UN missions often involve combat. Yes, contemporary peace support missions are more complex and involve a more active role for UN troops. Canadian service men and women who have taken part in peace missions know all too well how difficult and dangerous their jobs are when they must deal with weak mandates, a lack of resources and support, and complex on-the-ground situations. The reality is that the need for peace support almost always outstrips the resources and personnel available. However, the Canadian government can and should engage more in UN peace support missions. First, Canadian troops and support staff need more knowledge and training in peacekeeping. As Walter Dorn and Joshua Libben explain, less Canadian engagement with UN peace operations has resulted in a decline in the appropriate training. To support UN missions, our military, police, and mission-employed civilians need deeper knowledge about the UN system and the skills required in peace missions. Canada is already a leader in some relevant areas. In 2017, Canada launched the Elsie Initiative for Women in Peace Operations to “help overcome barriers” to greater “meaningful” participation of women in peace operations. Canada’s military is also the first to have guidelines on child soldiers. Canada can work with the UN to ensure greater support and development for such initiatives on a global scale. And, yes, there will still be times when well-equipped and well-trained UN peacekeepers are necessary to protect civilian populations. Canada should participate, in all the ways in which it can, in pursuing and keeping the global peace. Not only for ethical and humanitarian reasons, but because global security is, ultimately, a chief security concern of each and every nation on Earth.